Brilliant. Thanks for the pics. Going 'back in' this morning, will report back later! All sorted now. Thanks to all who contributed to both issues. Ha..funny you should say that!!! Bloody editing time! 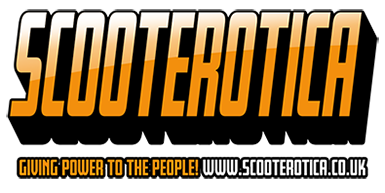 Was going to put that I am considering restoring scoot back to its former glory. Will certainly post pics if I do. Martin, did you get to the bottom of this. If you haven't solved this yet one........ thing test comes to mind that might be worth doing. If you ride at 50mph steady speed with a wide open throttle and then back the throttle off ever so slightly like about 1/8th throttle and note the change in engine note and performance . if the engine hesitates slightly then pulls strongly it indicates that your WOT mixture is too lean and you need to increase the size of your main jet. if the engine just bogs and there is no sign of any improvement then that would suggest a over rich mixture .....which would be borne out by your spark plug . Nice one Martin, its always a good feeling when you find the cause. I only asked because I had a similar problem, I was swopping jets every time I rode it, in the end I changed the HT lead and put a rubber suppresser cap on, bingo, it must have been arking through one or the other when bouncing down the road at around 50mph.